Large and small businesses alike are at risk of corporate fraud. There is always a person or entity who has the capability, resources, and desire to commit the kind of crime that benefits them and puts you in jeopardy. If you have any suspicion of wrongdoing, contact ASG Investigations to discuss a professionally conducted corporate fraud investigation and protect your business. Asset Abuse: Asset abuse can be big or small and can involve everything from theft of money to customer lists, technology to business plans. Any employee, contractor, or outside party who uses or manipulates your name or proprietary information in an unauthorized way for their own gains is also considered an abuse of assets and corporate fraud. Bribery: Is an employee getting something in return for giving something to others, all in the name of your business? Kickbacks and other perks are a form of bribery. This behavior can affect not only the reputation and success of a company, but the morale and performance of employees. Check Fraud: It’s easy to edit or duplicate checks with the help of modern technology. Whether an employee is fleecing you or an outside party is misappropriating funds, check fraud is the weapon of choice for thieves who want to benefit themselves on your dime. Credit Card Fraud: Credit card fraud can be incredibly costly and detrimental to an organization. Some companies find themselves on the hook for reimbursing customers who have been defrauded online or via a store credit security breach, not to mention internal financial troubles and a dented reputation. Computer Fraud: Stealing personal information, data, and financial details online are considered computer fraud, as well as sending unauthorized emails on behalf of your company or an employee or creating computer viruses. The threat can be internal or external, but it compromises all aspects of your corporation and livelihood. Contract Fraud: Developing a contract with the intention of deceiving another party is considered contract fraud. It’s essential to read the fine print and maintain legal counsel to avoid falling victim to this type of corporate fraud. Money Laundering: When someone brings in money illegally but makes it look like it’s on the up-and-up, this is considered money laundering. This type of corporate fraud can take the form of insider trading, gambling, kickbacks, and more. Purchase Order Fraud: Whether a thief wants one hot-ticket item or a major quantity of an item, they create a fake purchase order to get their goods, stealing a company’s information on their purchasing account and having it billed to them long after the crime has occurred. Shell Companies: A shell company is used to conceal misappropriated funds or hide the criminals behind a corporate fraud scheme or other types of criminal behavior. Shell companies have intricate layers and uncovering the kind of corruption that has been painstakingly made to look like it’s legal requires the expertise of an experience private investigator. 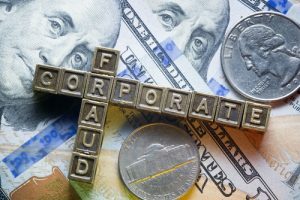 A professionally conducted corporate fraud investigation determines where a problem originated, whether it was a one-time occurrence or is still happening, who’s involved and who’s benefitting, and how it’s damaging your organization. The paper trail and online footprint for corporate fraud has become massive thanks to hackers and cybercriminals, but it takes a meticulously carried out private investigation to uncover the true depth of business crime. At ASG, we conduct corporate fraud investigations through specialized investigative techniques, including computer forensics and cell phone and tablet forensics. Tracing data, including deleted information, takes time and skill. Private surveillance can uncover texts, emails, call logs, GPS information, contacts, passwords, photos, videos, and more, not only identifying a sender but the recipients. Even your in-house technology guru cannot access the details a private investigator can gather with sophisticated tools and resources. Any in-house investigation, for that matter, will only scratch the surface of what’s really going on within your company’s walls or at its borders. An impartial third party with the tools to get to the bottom of the fraud that’s hitting your business is essential. Using undercover investigations and professional, high-tech surveillance, ASG investigators design complex undercover sting operations that identify what’s going on and do so legally so the information can be admissible in court, if necessary. There is no time to waste when you suspect your company has been a victim of corporate fraud. This kind of crime can happen quickly or it can slowly infiltrate your operation. Regardless of the means and method of business fraud, a private investigator is your best resource to identify the person or persons who have committed the fraud and gather all relevant evidence. At ASG Investigations, our experts have the tools, knowledge, and experience to see what’s really going on, even if a person you have always trusted is the one behind the fraud within your organization. You’re too close to what’s happening – rely on the impartial and confidential work of ASG Investigations for your corporate fraud investigation. Contact us today to schedule a consultation.